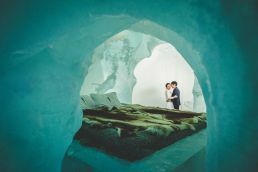 Each year, many couples choose to get married amongst natural crystal clear Arctic ice at ICEHOTEL in Jukkasjärvi – and recently, ICEHOTEL was named one of the world’s coolest wedding destinations by Brides Magazine UK. Far above the Arctic Circle, in the north of Sweden, you’ll find ICEHOTEL. A destination that has attracted wedding couples from all over the world to exchange vows in sub-zero degrees – for almost 30 years. – Our Ceremony Hall is created by different artists every year and each ceremony is completely unique, not only because of each couple’s wishes but also because of the art that changes day by day. Every winter, select artists create a new Ice Ceremony Hall. In addition to that, another 35 Art Suites are created for wedding couples and guests who like to spend a night on ice, some of them with a warm, private relax, bathroom, sauna and bathtub. There are warm chalets and hotel rooms at ICEHOTEL as well. For those who are looking for a spring-, summer- or fall wedding with a winter theme, ICEHOTEL is now open year round. 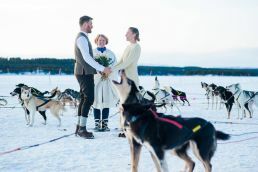 The hotel offers 20 Art Suites of ice and snow, an ice bar and an ice gallery, which is perfect for weddings, engagements and renewal of vows – and it is all cooled with help from the midnight sun that gives 24-hour daylight over the northern parts of Sweden during the summer months. 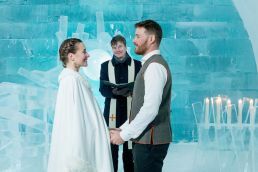 One of the wedding couples who got married in 2017 was artists Edith van de Wetering and Wilfred Stijger, who together with ICEHOTEL-veteran Tjåsa Gusfors created this year’s Ceremony Hall inside ICEHOTEL. 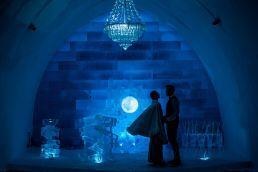 The artist couple had been dreaming of a wedding and when the Ceremony Hall was inaugurated, the opportunity presented itself and they got married amongst their own ice art. – It was like being in your own fairytale. The best memory from that day was when we walked in together, hand in hand, into the Ceremony Hall we had created together with Tjåsa and see all the people, says Wilfred. 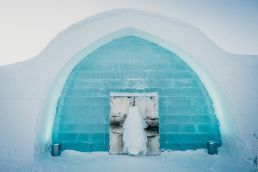 Around 70 weddings are held at ICEHOTEL every year. The ephemeral surroundings create memories that are extra cherished when no architectural memento exists. Edith and Wilfred also chose temporary rings – out of ice! – The ice rings were really cool and got colder after 10 minutes. 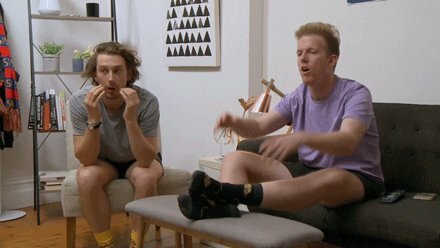 They melted slowly on our hands, tells Wilfred. About 70 wedding couples come to ICEHOTEL to get married – every year. Choose between an intimate and secret ceremony to a grand three-day party with hundreds of guests. 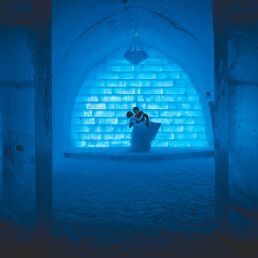 At ICEHOTEL, each wedding is tailored to the couple’s wishes. 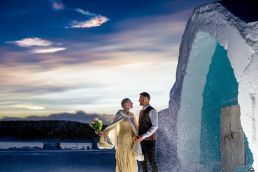 ICEHOTEL’s wedding specialist Louise Wallin helps the couples to tailor their perfect day. 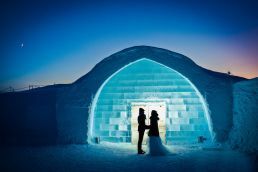 ICEHOTEL offers wedding ceremonies and accommodation amongst ice and snow year-round. Each winter select artists create a new Ceremony Hall. The year-round part of ICEHOTEL is run with help from solar power. Get lost in the northern lights that dance across the sky during the winter months and get fascinated by the bright nights during the summer when the midnight sun shines between May and July. ICEHOTEL Restaurant serves local delicacies like Kalix Löjrom (bleak roe), reindeer, Arctic Char and cloudberries, composed by Michelin-trained Head Chef Alexander Meier and his team. What’s more romantic than spending your first night as a married couple on a bed of crystal clear ice and soft reindeer hides? ICEHOTEL offers a number of different room categories from Deluxe Suites and more straightforward ice rooms and warm accommodation. As always, breakfast, sauna, loan of warm winter gear and free entrance to ICEHOTEL are included during your entire stay.